A 2-step mobile data-driven strategy was created. First, Campsite’s dynamic location-based audience tool was used to find which screens best reached the desired audience across Canada. The mobile audience data filters enabled the selection of locations with the highest concentration and the set-up of an efficient dayparting schedule which lead to capturing the devices exposed for the next step of the communication strategy. As the campaign ran in the chosen screens, Campsite – through its mobile data partnership with Native Touch - collected mobile data from the mobile phones of the consumers exposed to the screens. 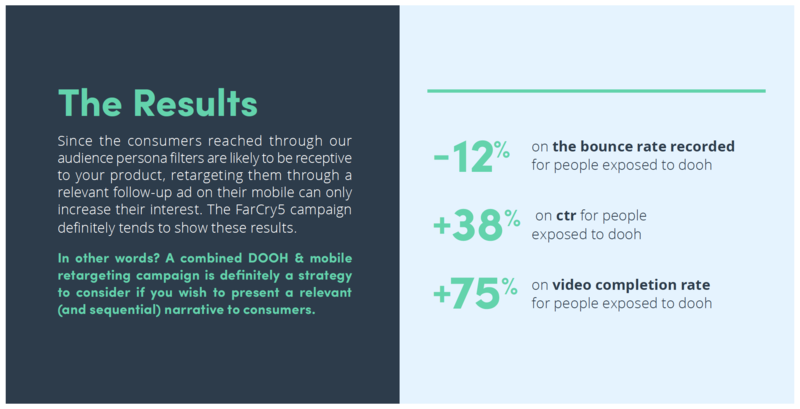 These IDs were then used as the data base for a sequential mobile retargeting campaign, supporting Ubisoft’s goal of offering a relevant communication path based on consumer data. Hence, consumers exposed to the DOOH ad saw one message, “Anything can happen and everything will”, and then the mobile campaign targeting those who’d seen the first message invited users to “Bring a friend, raise some hell”. Moreover, by subdividing the retargeting campaign in two groups - one exposed to the DOOH creative (Group A) and one that was not (Group B) – it became possible to setup a performance evaluation of the DOOH campaign. Toronto and Montreal, June 5, 2018– Campsite Global Inc. announced today that MaxTV Media, a well established network of high-quality interactive touch screens in residential condo buildings, has added their inventory to the Campsite platform. MaxTV has been working with properties to deliver customized digital communications to residents complimented by advertising. MaxTV has a solid footprint in the GTA and Ontario markets, making their inventory an undenialble asset to help Campsite buyers reach premium audiences in Residential environments.